Do you find it hard to purchase or make a pizza with your food allergies and sensitives or due to a healthy eating/vegan lifestyle? I have found it near impossible to purchase pre-made frozen pizzas from the grocery store as there is always 1-2 ingredients or products in them or on them I can't have due to allergies. 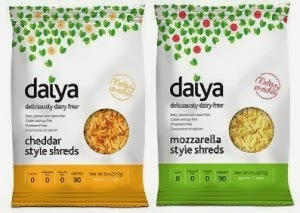 I have discovered the best combinations with gluten free and dairy free brands to create a delicious pizza that is safe for your digestive tract and only takes about 12-15 minutes in the oven. This is truly a tasty guilt free meal. I have tried many gluten free pizza doughs and found my favourite crust. 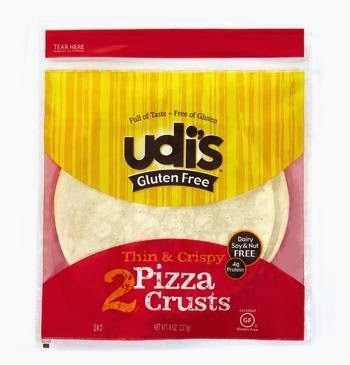 It's the Udi's Gluten Free pizza crust. It's a beautiful brown rice based thin crust pizza packed with flavour. It doesn't have the awkward taste that some GF crusts have or the strange texture. I served this pizza to friends that don't eat Gluten Free at a dinner party and they couldn't believe when I told them it was all GF and dairy free. They thought it was absolutely delicious. The Udi's package comes with 2 personal sized pizza crusts to customize to your liking. Udi's has several other of my favourite products such as their breads, bagels, and desserts. I use the following recipe to create the perfect gluten-free dairy-free pizza sauce or if I'm feeling a little lazy and want a quick fix I will use a plain tomato pasta sauce. at the deli counter beside in store pre-made pizza shelf. tofu section in produce at your local grocery store. Look at the back of the Udi's crust package for baking instructions. Just a heads up, almost all Udi's products use eggs which most people consider dairy. You should mention that because some people may buy it without looking at the label and end up being allergic to it or vegan. Could be less confusing as far as dietary choices go. Lots of talk about vegan, but no mention that the crusts have egg. I'll have to look for them since most of the crusts I have tried aren't very good. Not sure about the commennters statement that "most people consider dairy" to include eggs. I literally don't think I've ever met anybody that ignorant or misinformed, but obviously there must be a few out there. Where do you find your eggs in the grocery store? Dairy section.